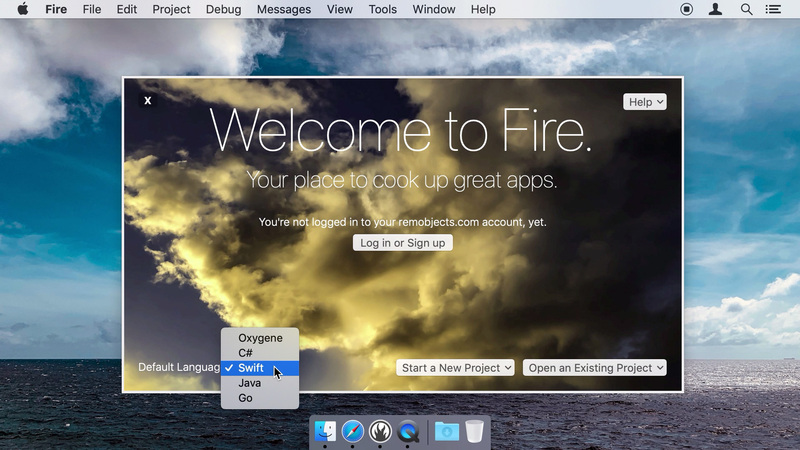 Welcome to Fire: Your place to cook up great apps. Fire is our development environment for the Elements compiler. Fire has been designed specifically for the Mac and for the four Elements languages, to give you the best possible development experience. It is lean, mean, fast and efficient – and simply put a beautiful place to work. Fire provides a first-class development experience tailored for the Mac, and focused on being efficient and getting out of your way to let you do what you do best: code. Fire does not clutter your UI, so if you go full screen, even on a small MacBook, all but a few pixels for the jump bar at the top are dedicated to your code. Fire never steals your focus from where you are typing, and never pops up model dialogs. And the Fire code editor – written and designed from scratch for Fire – never slows you down. Fire gives you access to deploying and debugging applications for all the various platforms it supports – whether locally or remotely. You can run macOS, .NET and Java apps right on your Mac, as you would expect. And iOS, tvOS and Android apps can easily be launched on attached devices, or in the simulator/emulator, as needed. And of course you can also use CrossBox 2 to connect to your Linux and Windows machines to run and debug your native Island projects. The sections above just scratch the surface of what Fire has to offer. While it is minimal and lets you get started quickly without getting in your way, it also provides a depth of sophisticated professional IDE features that make your day-to-day live easier, and make Fire – frankly – just a joy to work with. And not to mention it is blazingly fast too. Most of our development on Fire itself is done in Fire, and on a 12" MacBook Pro – a machine everyone calls too weak for professional use. Indeed, using Xcode on such a low end Mac is not fun, but Fire never breaks into a sweat. Just imagine what it'll do on top-of-the-line Mac hardware. Use the Echoes platform and .NET/Mono to write native Windows apps, create cross-platform server and command line tools or develop ASP.NET websites. Use the Toffee platform and Cocoa to create native apps for your Mac – and for iOS, tvOS and watchOS – using the same native APIs as Objective-C and Swift developers. Read More about each of the Platforms. Download is in H.264 format at 1280x720. It is suitable for desktops, iPad, iPhone and Android.